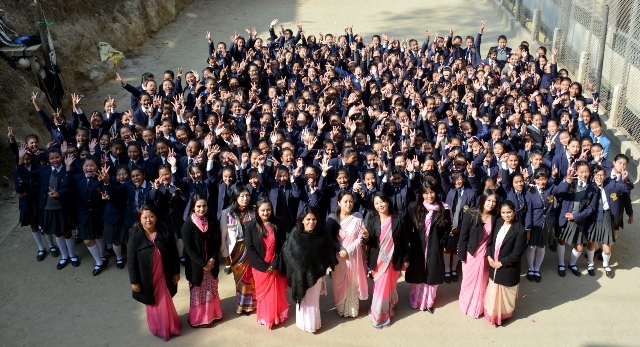 On 8th March our school celebrated the International Women�s Day. To mark the occasion we had Special Assembly presided over by our School�s Director. All the students were asked to come in their formal uniform. The girls instead of their white ribbons adorned their plaited hair wearing pink ribbons. The lady teachers too wore saris in different shades of pink. The colour pink was prominently visible that day because �Pink� is associated with �feminity�. The assembly started with the school prayer, which was then followed by some inspiring speeches on women and their achievements read out by five of our senior girls. 2017, the theme for the International Women�s Day was �Women in Changing World of Work: Planet 50-50 by 2030, asking for #BeBoldForChange. It highlights on to call the masses or yourself to put efforts to make a more gender inclusive world. The theme focuses on UN�s 2030 agenda to achieve gender equality empowerment and human right�s of all women and releasing the true potential of women around the world. The 2030 agenda also includes quality and free education, access to quality early child�s development; eliminate discrimination, harmful practices and violence against women. The United Nation�s Women Executive Director Phumzile Malambo Nqcuka � has rightfully said, �There is no place in a child�s environment that girls must be less, have less, and dream smaller than boys�. Women and girls must be ready for the digital revolution and take up STEM subjects- (Science, Technology, Engineering and Mathematics) if they are compete successfully, for high paying �new collar� jobs. The assembly ended with the singing of the school �Anthem.� The highlight of the day was a song titled �Hero�, sung beautifully by Miss Sharon Lakhandri (10 Sc).